On Monday at noon in Rome, the Vatican’s Press Office confirmed to [Catholic News Agency] that Pope Benedict will be receiving U.S. Speaker of the House Nancy Pelosi in an audience at noon on Wednesday. 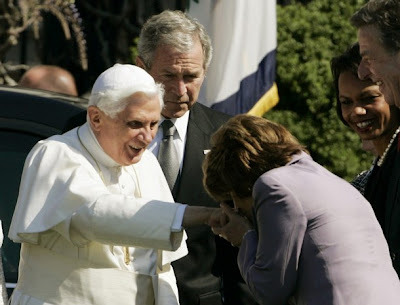 Although numerous reports have been published either confirming or denying that Pope Benedict would receive Pelosi in an audience, the Holy See’s Press Office confirmed to CNA on Monday at noon Rome time, that the Holy Father will receive the U.S. representative on Wednesday at midday. Over this past weekend pro-life activists and bloggers launched verbal salvos against the Vatican because they believe that the Holy See plans to present Nancy Pelosi with an award. This is definitely not true, the Vatican’s press office told CNA. The idea that Pelosi would be awarded by the Vatican most likely is the result of activists confusing the visit to the Vatican with the Speaker of the House being awarded by a group of Italian legislators for being the first Italian American to reach such a high rank in the U.S. government. Following August comments on Meet the Press attempting to reconcile her faith with her pro-choice stance, the California Democrat was criticized by a number of Stateside bishops and invited to a "conversation" with her ordinary, Archbishop George Niederauer of San Francisco.